The Chester County Planning Commission is tasked with an important function of inventorying and prioritizing transportation improvement projects within Chester County. The programming process begins with the Chester County Transportation Improvements Inventory, which is updated every two years. 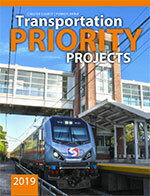 The most critical projects are recognized as Transportation Priority Projects. To access state and federal transportation funds, a project must first by listed on the Delaware Valley Regional Planning Commission's 25-year long range plan. Once listed on the Long Range Plan, a project becomes eligible to be programmed on the Delaware Valley Regional Planning Commission's Transportation Improvement Program, which is a four-year capital program. Once funding for a project is listed on the Transportation Improvement Program, design and engineering on a project can commence. Finally, once engineering of a project concludes, a project can advance to construction. 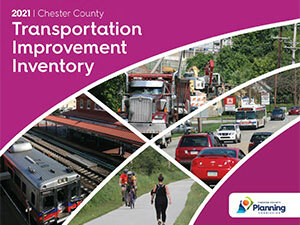 The Transportation Improvement Inventory (TII) is a comprehensive record of known transportation needs and projects within Chester County. The TII is updated biennially and contains projects that have been recommended to the Planning Commission by municipalities and other stakeholders over time. It includes 508 proposed roadway, bridge, bicycle and pedestrian, freight, and transit projects with a total estimated cost of $4.25 billion. Use the PennDOT Project ID (MPMS #) listed in the TII to gather up-to-date information for specific projects from the following websites: PennDOT Project ID (MPMS #) Search and DVRPC Transportation Improvement Program (TIP) Search and Online Mapping. As input towards the development of the 2017-2020 Transportation Improvement Program, the Chester County Planning Commission has updated this list of Transportation Priority Projects. Status of Priority Transportation Projects, as of February 2019, can be found here. The Transportation Improvement Program (TIP) is the regionally agreed-upon list of priority transportation projects, as required by federal law. The TIP shows estimated costs and schedule by project phase and is financially constrained based on the amount of federal, state, and local funds that will be available for transportation projects in the region. The TIP includes roadway, bridge, public transit, bicycle, pedestrian, and freight related transportation projects. The TIP is adopted by the Delaware Valley Regional Planning Commission (DVRPC), which is the federally designated Metropolitan Planning Organization for the Philadelphia--Camden--Trenton Metropolitan Area. The TIP can be amended after it is adopted and is updated every two years. 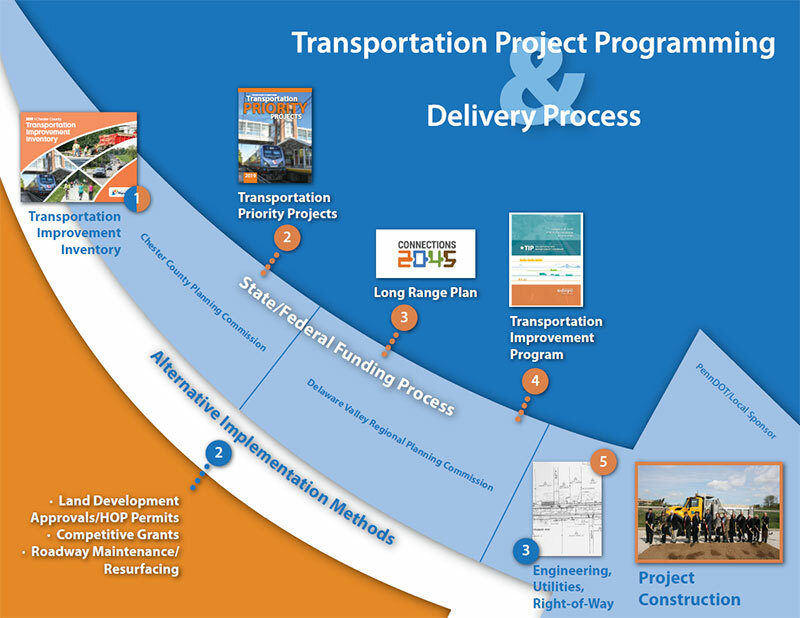 For an overview of the TIP, how it was developed, and how you can become involved, see the DVRPC Transportation Improvement Program (TIP) Handbook. This guide is also available in spanish.